If you want to mess around with your Xbox 360 controllers on a computer Microsoft would be happy to sell you a USB dongle to do so. But [Tino] went a different route. The board that drives the Xbox 360’s status light ring also includes the RF module that wirelessly connects the controllers. 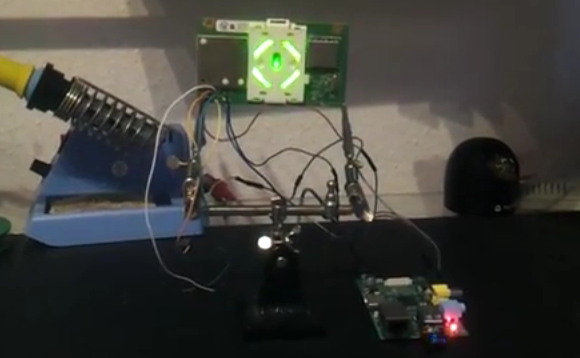 He wired this up to his Raspberry Pi using the GPIO header. The module connects via an internal cable and is treated much like a USB device by the Xbox motherboard. The problem is that it won’t actually handle the 5V rail found on a USB connector; it wants 3.3V. But this is no problem for the RPi’s pin header. Once a few connections have been made the lights are controlled via SPI I2C and [Tino] posted some example code up on Github to work with the RF module. He plans to post a follow-up that interfaces the module with a simple microcontroller rather than an RPi board. If you can’t wait for that we’re sure you can figure out the details you need by digging through his example code. [Ibrahim] picked this little LCD module out because of its price point and resolution. In single units you can grab one of the 128×32 pixel displays for just $11. The only problem is that the pinout is too small to use with a breadboard. He whipped up a breakout board for it that throws in some extras. First off, we like it that the board doesn’t add much to the part’s outline. What it does add is a Low-DropOut voltage regulator and a level converter. The upper range of the LCD’s input voltage is 3.3V, and these added parts make it possible to drive the device using 5V hardware like the Arduino Uno pictured above. While he was adding in parts he included a MOSFET to switch the backlight. This way he can use PWM for dimming as well. We usually hit eBay when looking for LCD screens. A search for the NHD-C12832 part number didn’t turn it up. We tried out FindChips for the first time (owned by Supply Frame who just bought Hackaday) and it works just as well as Octopart which we’re more familiar with since we’ve seen some hacking of that site before. Over at TI, the 2013 Intern Design Challenge is underway, an opportunity for the interns of TI to flex their engineering muscle for a few prizes and a chance to have their designs turned into actual products. We’re thinking [Max] might just pull this one out with his BeagleBone Gaming Cape, an add-on to the BeagleBone Black that turns this ARM-powered Linux board into a retro gaming system. The build was inspired by [Max]’s earlier MSP430 Launchpad GamingPack, an add-on board for the Launchpad that put two NES controllers, a VGA out, and an FPGA to create a custom gaming console that’s up there with the brightest and best consoles of the 16-bit era. For the new BeagleBone-based build, [Max] eschewed off-board processing, but did manage to include a magnetometer/accelerometer and an audio codec IC to provide the best gaming experience for all those NES, Game Gear. Gameboy, GBA and Doom .wad games. The diamond engagement ring is arguably the most universally adopted of all jewelry. It’s artwork that even the most common men and women appreciate, and it’s creation calls for skills that go back centuries. [Jerome Kelty] crafts custom jewelry from platinum. Here’s an in-depth look at his process. The first step of his Instructable post is so long you might be fooled into thinking it’s the whole post. He shows off the equipment that he used in taking this ring from design to reality — we thought the use of beeswax to pick up small stones is an interesting technique. Click through the steps to see that he starts with a cad drawing. This model is sent offsite for casting and arrives back as an oversized blank which he then begins to clean up. A range of differend files bring it to its finished shape. He preps the areas where stones will be set. A trip to the buffing wheel gives it the shine it needs before the diamonds are put in place. Regular Hackaday readers may recognize his name. When [Jerome] isn’t making jewelry he’s building animatronics, like Predator or Stargate replicas. Perspective is a bit hard to grasp in this image, but all of this hardware is mounted thirty feet above the ground. This time-lapse photography box makes use of the sun and a Raspberry Pi to document the goings on. The rig is one of three that were built by [Patty Chuck] to record progress on a seventy acre construction site over the course of eighteen months. The gallery linked above shows off the project well, but a much more in-depth text description is found in his Reddit thread. What’s not shown in the image is a solar array which powers the box. When they were installed there were no utilities on site. To guard against power-loss there’s a hardware RTC that keeps ticking. The Raspberry Pi uses GPIO pins to switch the Nikon D7100 camera on once every five minutes during the work day. It snaps a photo before powering it down again. It also monitors a temperature sensor and actuates circulation fans if necessary. He’s planning to post the videos once the project’s done in 18 months. If you see them and remember this post, send us the link and we’ll post the update.